The University of Scranton was founded as Saint Thomas College by Most Reverend William G. O’Hara, D.D., the first Bishop of Scranton, who had always hoped to provide an opportunity for higher education in the Lackawanna Valley. In August 1888, with few resources at hand, he blessed a single block of granite as a cornerstone for his new college, which would admit its first students four years later. The cornerstone of Old Main is preserved in the wall of St. Thomas Hall. 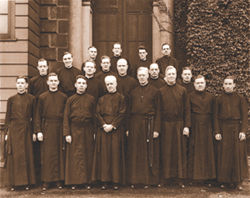 The college was staffed by diocesan priests and seminarians until 1896 and then, for one year, by the Xaverian Brothers. From 1897 until 1942 the school, which was renamed The University of Scranton in 1938, was administered for the Diocese by the Christian Brothers. In the late summer of 1942, at the invitation of Most Reverend William Hafey, D.D., 19 Jesuits, led by Rev. Coleman Nevils, S.J., the newly appointed president, arrived on campus to administer the University. The Jesuits restructured and strengthened Scranton’s traditional and pre-professional programs with an emphasis on the liberal arts, which are the foundation for every program at a Jesuit university. This emphasis is intended to give Scranton students an appreciation for all disciplines as they develop specific subject knowledge. The University has flourished under the Jesuits, growing from a primarily commuter school with fewer than 1,000 students to a broadly regional university with a total enrollment of about 5,300 students in undergraduate, graduate and nontraditional programs. In these early years of the 21st century, the University is building on its historical and educational heritage guided by its "Engaged, Integrated, Global" strategic plan for 2015-2020. This plan guides the University's efforts in ever-improving the education and formation of students in the Catholic, Jesuit educational tradition through learning experiences that are transformative and reflective. Integrated teaching and learning opportunities across disciplines and programs emphasize understanding, discernment and action in a global context. On September 16, 2011, before delegates representing nearly 100 colleges, universities and learned societies from across the country joining nearly 2,000 dignitaries, students, faculty, staff and community members, the University conducted an Inauguration Ceremony for Kevin P. Quinn, S.J. Rev. Herbert Keller, S.J., served as interim president during the 2017-18 academic year. In July 2018, Scott R. Pilarz, S.J., began his second tenure as president of The University of Scranton. He is the 27th president of the University. The University remains committed to enriching the quality and variety of its academic offerings. In addition, it continues to invest in its physical plant, opening a 118,000-square-foot campus center and 386-bed sophomore residence hall in 2008. In fall 2011, Scranton also welcomed two more facilities to the city's skyline: the Loyola Science Center and an apartment and fitness complex on the 900 block of Mulberry Street. The 200,000-square-foot science center is home to 22 class and seminar rooms, 34 laboratories and a multistory atrium. It is a fitting home to Scranton's rich legacy of science education and serves as a center of collaborative learning for all members of the campus and community. The apartment and fitness complex, which consists of the Rev. Scott R. Pilarz, S.J., Hall and Montrone Hall, stands directly across the street from the Patrick and Margaret DeNaples Center and provides fitness space, a dining area and apartment-style units to accommodate 400 juniors and seniors.